Goodreads: On a searing August day, Melisandre Harris Dawes committed the unthinkable: she left her two-month-old daughter locked in a car while she sat nearby on the shores of the Patapsco River. Melisandre was found not guilty by reason of criminal insanity, although there was much skepticism about her mental state. Freed, she left the country, her husband and her two surviving children, determined to start over. But now Melisandre has returned Baltimore to meet with her estranged teenage daughters and wants to film the reunion for a documentary. The problem is, she relinquished custody and her ex, now remarried, isn't sure he approves. Now that's she's a mother herself--short on time, patience--Tess Monaghan wants nothing to do with a woman crazy enough to have killed her own child. But her mentor and close friend Tyner Gray, Melisandre's lawyer, has asked Tess and her new partner, retired Baltimore P.D. homicide detective Sandy Sanchez, to assess Melisandre's security needs. As a former reporter and private investigator, Tess tries to understand why other people break the rules and the law. Yet the imperious Melisandre is something far different from anyone she's encountered. A decade ago, a judge ruled that Melisandre was beyond rational thought. But was she? Tess tries to ignore the discomfort she feels around the confident, manipulative Melisandre. But that gets tricky after Melisandre becomes a prime suspect in a murder. Yet as her suspicions deepen, Tess realizes that just as she's been scrutinizing Melisandre, a judgmental stalker has been watching her every move as well. . .
With that said, I did love this book. I loved how Tess' personal story, being a new mom really impacted the way she investigated this story. She definitely couldn't keep home and work separate. Saying this, I loved that her personal life intertwined with her work life, made for a more realistic and true story. After having just read the first book, I could completely see a drastic change in the Tess from the first book compared to this one, now I would love to read the evolution. 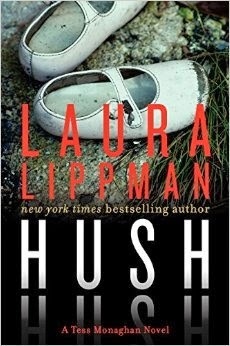 Laura Lippman is a great writer. She mixes fact and fiction, location and characters and comes up with a great story that keeps a reader engaged from the beginning to the end. I would recommend her to readers who don't tend to read the mystery/thriller genre, her story has full plots that are just great reads! As a mom myself I can appreciate the difficulty in keeping work and personal life separate. It must be even worse if you have the kind of job Tess does!